Watch the introduction to Language of Caring for Staff® or read below to learn more about this breakthrough program. Caring and communicating caring are two different things. No doubt, people in healthcare are caring people who intend to be caring in their work. Yet, these days, job demands, and pressures cause people to be so task-oriented, that they don’t make their caring felt. When employees don’t express their caring, when they don’t make their caring visible, it’s as good as absent from the experience of patients and families. Language of Caring for Staff is a dynamic, evidence-based strategy designed to help your healthcare teams show how much they care; improve your patient outcomes, CAHPS scores, and financial health; ensure patient safety; and support your organization’s mission. The solution creates alignment by developing a common language for caring communication; it clearly defines and standardizes best-practice communication skills without scripting. It mobilizes all employees as engaged contributors who together create a culture and community of caring that advances your inspiring mission … all without adding time to their already crammed days and nights. Language of Caring for Staff makes your other initiatives more effective. It builds the communication skills key to quality implementation of best-practice tactics, such as hourly rounding, greeting protocols, discharge phone calls, whiteboard conversations, and more. The Language of Caring® skills are invaluable, versatile, life skills that enhance communication and strengthen relationships beyond the workplace. These skills are not only valuable with patients, families and coworkers, but also with family and friends. 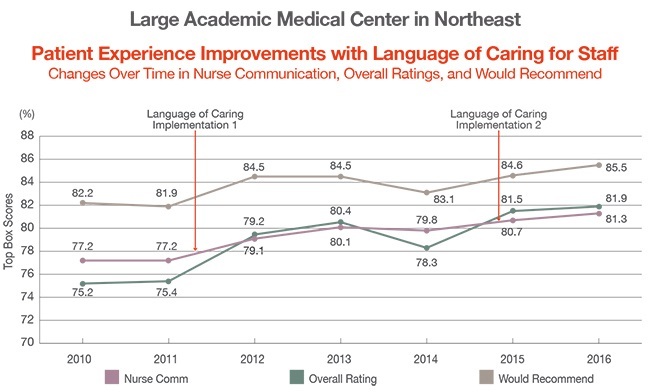 State-of-the-Art Learning Approach: Language of Caring for Staff employs a blended learning approach that joins the best aspects of face-to-face with web-based instruction and resources, including interactive and engaging web-based skill modules, team learning, and hardwiring. Each skill module also includes a compelling instructional video filmed on location at Banner Health in Phoenix, with Banner Health physicians and staff as the cast. For more detailed information about the philosophy and methodology of Language of Caring, click here.